You are here: Home > Media > Blog > Will 2019 see a ‘new dawn’ for pay? Will 2019 see a ‘new dawn’ for pay? What does 2019 have in store for pay? 2018 was the year in which we left behind the pay squeeze of 2017. Nominal growth increased throughout the year, reaching 3 per cent for the first time in a decade. Will this momentum continue into 2019? The Bank of England thinks so. It forecasts average pay growth increasing in 2019 (from 2.75 to 3.25 per cent on their measure).1 The Office for Budget Responsibility (OBR), by contrast, thinks pay will cool slightly in 2019 (from 2.58 to 2.52 per cent on their measure).2 In October, the Bank’s chief economist Andy Haldane heralded a ‘new dawn’ in pay.3 The OBR’s more pessimistic outlook could be labelled ‘false dawn’. So who is right? Brexit uncertainty notwithstanding, at present there seems more support for a ‘new dawn’ – stronger pay growth throughout 2019. To illustrate the OBR’s projections, in the chart below we use the OBR’s projections and convert these into AWE, the headline measure of pay. According to this projection, nominal pay growth has peaked, and will fall back below the 3 per cent threshold in the summer. The OBR cites policy effects; it thinks the increase in costs associated with higher auto-enrolment pensions contributions, and the apprenticeship levy, will both be partly borne by workers, and will therefore bear down on wages. However, the OBR might be being overly pessimistic. Since their latest projection (published in the October 2018 budget) we have had an additional four months of data. 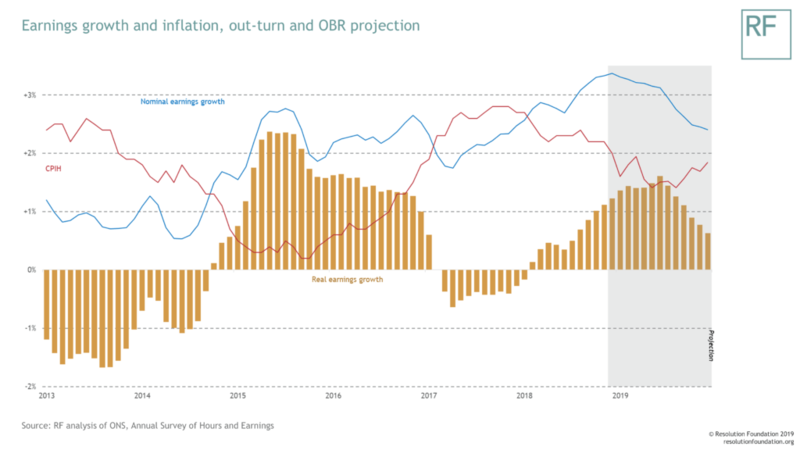 In these months (giving us data up to November 2018) pay growth increased, reaching a high of 3.3 per cent, whereas the OBR expected average earnings growth to fall in the final quarter of 2018. Therefore, having got the short-term direction of travel wrong, we might expect pay growth in 2019 to be stronger than the OBR expected in October. The problem is that the OBR is not normally pessimistic on pay – they have tended to be the opposite. 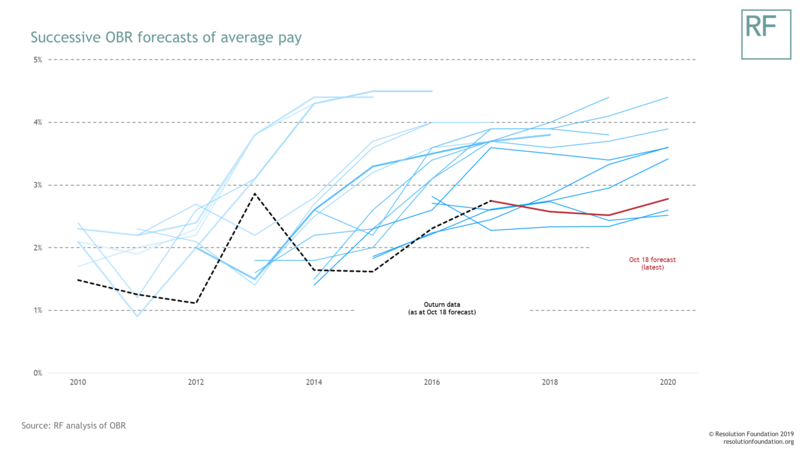 Of the OBR’s 19 pay forecasts since June 2010, only one has been an underestimate.4 The Bank of England has a similar record of overestimating pay growth. In both cases, the main reason has been an overestimation of productivity growth. So where does this leave us? One the one hand, the lesson of the last decade has been that we should stop expecting a return to pre-crisis norms in productivity and pay growth. Forecasts that reflect the last decade’s dismal record, as the OBR and Bank’s forecasts increasingly do, are surely more plausible. And yet, the latest data suggests the OBR are now being overly pessimistic about prospects for pay growth in 2019. And given the tightness of the labour market, we would expect strong nominal pay growth to continue. Unemployment fell again in the latest data, and other measures of labour market slack continue to fall. With this in mind, it seems unlikely that nominal pay growth will drop back below 3 per cent in 2019. The OBR are right about the potential pay-dampening effects of auto-enrolment and the apprenticeship levy, but the effects might simply be smaller or more diffuse than expected. The Bank’s expectation of increasing nominal pay growth in 2019 – a ‘new dawn’ in pay – seems the likelier bet. This is good news. With inflation expected to track down towards its 2 per cent target, this means real pay growth would remain well above 1 per cent. The only other period since the recession with real pay growth above 1 per cent was in 2015-16, and that was largely due to a bout of very low inflation. Today, in contrast, real pay growth is on firmer ground – stemming from higher nominal increases. However, although prospects for the year ahead are positive, the ‘new dawn’ comes with two warning notes. First is that this dawn is still not very bright. Pre-2008, 4 per cent nominal pay growth was the norm – we are heralding 3 per cent. The second patch of darkness is Brexit. The OBR and Bank forecasts discussed here assume a smooth Brexit, and no changes in trading arrangements until 2021. With no withdrawal agreement yet secured, and the March deadline looming, that assumption is increasingly under threat. Perhaps uncertainty is the only sure bet for 2019. Bank of England,: Inflation Report, November 2019. Note that the Bank and the OBR’s measures of average pay are not identical to the headline ‘average weekly regular earnings’ (AWE) measure we use, meaning growth rates are not directly comparable. Calculated by taking the cumulative impact of the forecasts (using annual data), up to year 2017 and comparing this to the path of the outturn in the same period.